I don't want to go into any great detail about the Jets' thrilling, yet disappointing overtime loss in Foxboro. Whether they could've won but should've lost, or played well enough to win and sabotaged themselves are all angles that Mike Francesa will no doubt pick apart at 1 PM ET. 1. Jeremy Kerley - A 5th round pick in 2011, and at only 5'9" he was supposed to be a slot guy and special teamer. 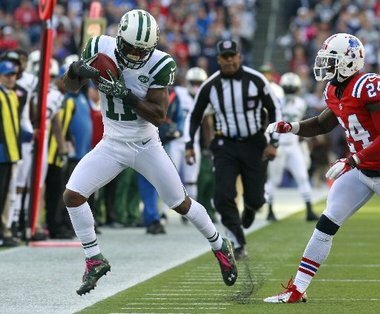 Through releases and attrition, Kerley's become the Jets top receiver. He's electric after the catch, and already brought a punt back for a TD this year. 2. Nick Folk - What do you say when your kicker is maybe your best player? You shut up and take the 3 points. After two very productive seasons, the Jets brought in veteran Josh Brown for some preseason competition. Folk won the job and is 11/11 on FGs this year including a 54 and two from 43 yesterday. 3. Antonio Cromartie - Yes he shoots off his mouth and sometimes makes dumb penalties. But he's a shut-down corner, who's had to step up his game with Revis out. Always a threat to pick a ball he looks beaten on, and then take it to the house from there. 4. Robert Malone - The punter's good too. Robert Malone's got a 47.1 average, and put 11 of his 35 punts inside the 20. The 41.0 net average is very solid. A key field position weapon. 5. Joe McKnight - With the injuries in the secondary, he balked about being moved to corner. And with good reason - because he's the Jets best running back. When will the coaches realize this? Durability is definitely an issue, but he's proven to be a game-changer. His kick return TD against Houston was the team's most inspired play of the season. 6. LaRon Landry - The Jets' best offseason acquisition hasn't been spectacular, but is a solid run-stopper with 50 tackles on the season. And more than that, his presence (and reputation) makes opposing receivers think twice about going over the middle before they even step on the field. 7. Dustin Keller - He missed 5 of the 7 games and still makes this list, that's how desperate the Jets are for his offense. He was a steady and tough target in the Patriot game, our answer to Gronk. Please note who is not on the list, neither Mark Sanchez nor Tim Tebow. Sanchez's performance has been uneven to say the least, showing both flashes of brilliance and horror. Tebow could have snuck on the list but clearly hasn't had the opportunities, or done very much when he's had them outside of a few plays. Also absent from the list, anyone on the Jets' offensive line or defensive front seven. I'm no expert at grading line play, but the O-Line has multiple Pro Bowlers and haven't kept the pass rush off Sanchez. They've plowed the way for a dominant running game in just one out of seven games. And as for the D-Line and Linebackers, nobody is making plays behind the line of scrimmage - and don't tell me about David Harrris's one sack this year! While the skill guys get the glory, it's the interior guys that mold a team's identity, and the Jets have been pushed around this year. That's the report through Game 7. Oh and by the way, everybody enjoy the big baseball Game 7 tonight. You might want to get out your Bob Carpenter Scorebook for this one!